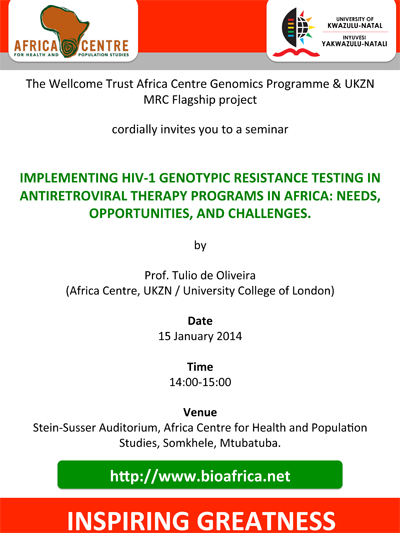 KRISP News: Seminar: Implementing HIV-1 Genotypic Resistance Testing in Antiretroviral Therapy Programs in Africa: Needs, Opportunities, and Challenges. Seminar: Implementing HIV-1 Genotypic Resistance Testing in Antiretroviral Therapy Programs in Africa: Needs, Opportunities, and Challenges. This presentation also included a live Twitter Question and Answers section, see responses to answers in our blog. We also provide open access to the paper Implementing HIV-1 Genotypic Resistance Testing in Antiretroviral Therapy Programs in Africa: Needs, Opportunities, and Challenges. , which was presented in this seminar.